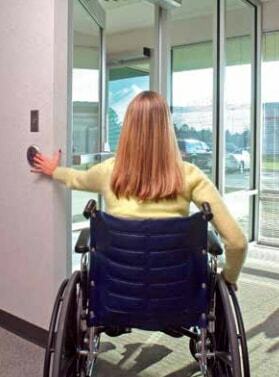 Keep your facility in compliance with the Americans with Disabilities Act (ADA) by installing automatic door operators. Our technicians are fully-trained in the installation and service of automatic door operators, and our sales team will advise you on the correct system for your facility. SDC manufactures a range of access systems, mag locks, and electric strikes. LCN automatic operators are available in pneumatic, electrohydraulic, and electromechanical operating styles. Norton door operators are used in schools, hospitals, and businesses around the globe. This entry was posted on Thursday, March 3rd, 2016 at 5:29 pm. Both comments and pings are currently closed.